State officials say the Lake Oroville water level was 26 feet below the emergency spillway by Wednesday night. The Department of Water Resources says crews continue to work around the clock to make emergency repairs. It says barges and cranes are being mobilized to remove debris and sediment from the diversion pool. The department says about 100,000 cubic feet of water was flowing from the reservoir each second, enough to fill an Olympic-size swimming pool. Forecasts call for 2-4 inches of rain and snow in the foothills and mountains starting Wednesday night or early Thursday. But the storm was looking colder than projected, meaning less rain and less runoff than last week's storms. A California sheriff says a number of homes in an evacuation zone below a dam's damaged spillways have been burglarized and arrests have been made. Butte County Sheriff Kory Honea said Wednesday that he didn't know exactly how many arrests deputies have made. Also at a news conference, he called on private drone operators to refrain from flying the devices over Oroville Dam, the nation's tallest. He says private drones can interfere with repair work. Dump trucks and helicopters have dropped thousands of tons of rocks and sandbags to shore up the dam's spillways and avoid what officials had warned could be a catastrophic failure and flood downstream. California water officials say cementing rocks in place at the damaged spillways of the nation's tallest dam is a "short-term and long-term fix." Dump trucks and helicopters have dropped thousands of tons of rocks and sandbags to shore up the spillways at Oroville Dam and avoid what officials had warned could be a catastrophic failure and flood downstream. Department of Water Resources acting Director Bill Croyle also says the storms this week won't pose a threat to an emergency spillway other than to slow crews. National Weather Service forecaster Tom Dang says the first of two storms was expected to be light. The first could bring 2-3 inches of rain Wednesday followed by a smaller accumulation from the second storm. California water officials say they're making "great progress" on the repairs to the damaged spillways of the nation's tallest dam. Department of Water Resources acting chief Bill Croyle says Oroville Lake behind the dam is draining rapidly and has dropped some 20 feet since it reached capacity early Sunday and overflowed an emergency spillway. Croyle says a storm Wednesday appears to be small and that the reservoir's water levels should keep shrinking. He says crews "are still removing more water from the reservoir than we would receive from the storm system coming in." A California sheriff has acknowledged that the evacuation below a California dam's damaged spillway was "chaotic." Butte County Sheriff Kory Honea told nearly 200,000 residents Wednesday to use the time this week before the storms fully move in to prepare for another evacuation if needed. An order to leave was lifted Tuesday. Some rain has started to fall Wednesday. Department of Water Resource acting Chief Bill Croyle says the damaged main spillway "has been stable for a number of days." Butte County Sheriff Kory Honea is telling residents downstream of a California dam's damaged spillway to be prepared to leave at a moment's notice if the risk of flooding increases. Honea says "this is still an emergency situation. It's important for people to be prepared." Rain had started to fall in the area Wednesday. Nearly 200,000 people remain under an evacuation warning but an order to leave their homes was lifted Tuesday. A California couple got married at an evacuation center on Valentine's Day after they were displaced from their home amid fears that a damaged spillway at the Lake Oroville dam could fail and unleash a wall of water. KRON reports (http://bit.ly/2kKIoHs) that Leotta and Henry Ruedas had been planning for 10 years to get married on Valentine's Day this year. But on Sunday they were forced to leave their home and go to the Placer County Fairgrounds evacuation center. That's where they tied the knot. The couple was among 200,000 Californians who were ordered to evacuate because they live downstream from the dam. Evacuees at the fairgrounds became impromptu wedding planners and guests thanks to a Facebook post. People donated a wedding dress, tuxedo, food, drinks, flowers, hotel room and limo. About 300 people at the center joined in the celebration. The Oroville Reservoir is continuing to drain as state water officials scrambled to reduce the lake's level ahead of impending storms. 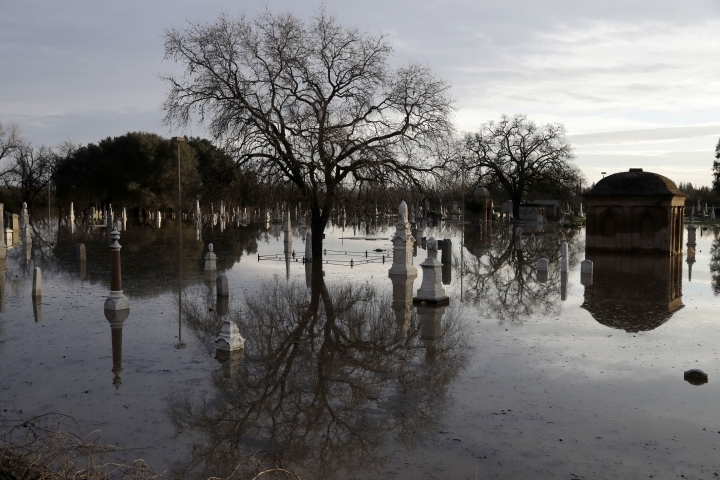 State Department of Water Resources spokesman Chris Orrock says that the reservoir was down 20 feet since it reached capacity on Sunday when it overflowed and sparked an evacuation order for nearly 200,000 people south of the dam. Orrock says the lake is draining at 100,000 cubic feet per second, reducing the reservoir about a foot every three hours. Orrock says the department wants to drop the reservoir's level 50 feet overall by Sunday. 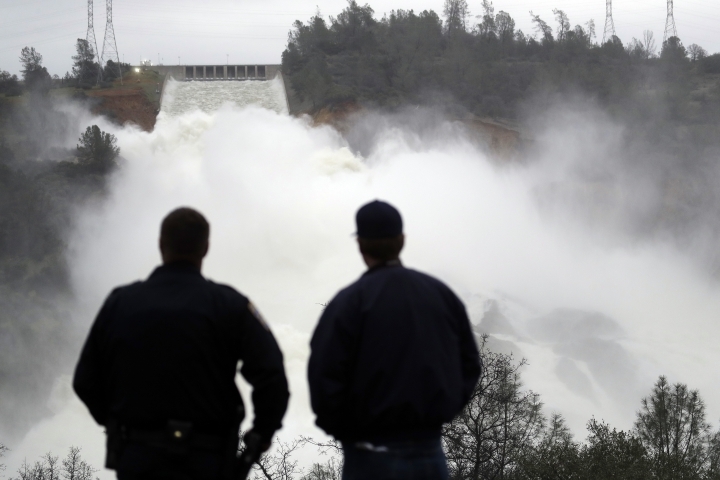 The Los Angeles Times reports (http://lat.ms/2lKMK5I) that the reservoir was down 20 feet since it reached capacity on Sunday when it overflowed and sparked an evacuation order for nearly 200,000 people south of the dam. Officials say the lake is draining at 100,000 cubic feet per second, reducing the reservoir about a foot every three hours. The Department of Water Resources wants to drop the reservoir's level 50 feet overall by Sunday. Forecasts call for 2-4 inches of rain and snow in the foothills and mountains starting Wednesday night or early Thursday. But the storm was looking colder than initially projected, meaning less rain and less runoff than last week's storms. The stress of evacuation and an uncertain future were enough for Donald Azevedo and his family to opt to stay a few more nights in an emergency shelter rather than risk having to do it all again. The family was among the nearly 200,000 Californians who live downstream from the country's tallest dam who were told they could return home but warned they may have to flee again if repairs made to the battered Oroville Dam spillways don't hold. The fixes could be put to their first test later this week with the first of a series of small storms forecast for the region expected to reach the area Wednesday night.